The radioactive material is transported in special transport packages that are designed to withstand severe accident scenarios. The packages – called “casks” or “flasks” – are massive steel structures made from 25 cm thick forged steel. The ones typically carried by PNTL weigh around 100 tonnes. The standards for packages of nuclear material are set by the International Atomic Energy Agency (IAEA), which is a United Nations agency. The standards have been established by experts and national regulators from many of the 151 member countries and are systematically reviewed to take account of technical advances. The IAEA regulations require that nuclear materials are placed in packages that will protect workers, the public and the environment in severe accident situations. This ensures high levels of safety whatever mode of transport is used. Many shipments involve transport by a combination of different modes – road, rail, air and sea. The IAEA has set standards for packages based on the different characteristics of the nuclear material being transported. PNTL’s cargoes of used fuel, vitrified waste and MOX fuel must be moved in “Type B” packages. These special packages must be able to withstand a series of challenging tests that demonstrate resistance to severe impact, fire and immersion. 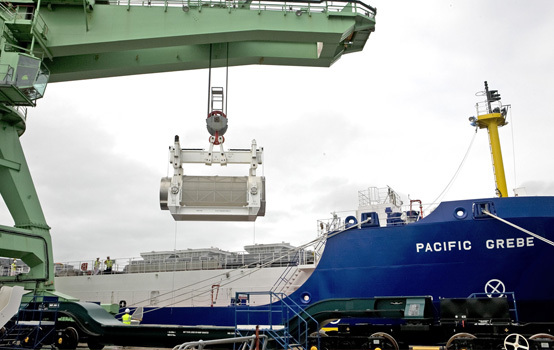 Special packages called 'casks' help ensure the safe transport of nuclear materials on PNTL ships.